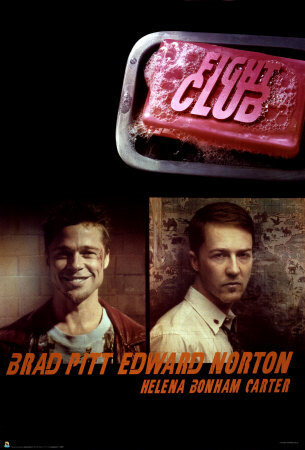 You have no idea how excited I was that Fight Club (1999) would be on television over the weekend. It was just one of those movies that I was ashamed to say I have never seen (I really need to make a list of those). And you know you what? Fight Club was bloody awesome (ha, no pun intended). An office employee (known as 'The Narrator', played by Edward Norton) meets Tyler Durden (Brad Pitt), a soap salesman, on a plane. The two are brought back together under unusual circumstances, and as they become closer, they decide to open up an organization which vents male agression. The first rule of Fight Club: you don't talk about Fight Club. This film has all the violence I have ever wanted in a movie. Then it packs another punch with it's powerhouse performances from Edward Norton, Brad Pitt and Helena Bonham Carter. And at the end, there is my favourite music moment in film history...'Where is My Mind?' totally narrates the rest of the scene. David Fincher has joined my ever-growing list of 'geniuses', it's actuallly hard to believe that he ever directed The Curious Case of Benjamin Button. You know what? I'm going to bump the rating of this film up a little.